NEW YORK, NY – Thursday, March 21, 2019 – As many of you know, the Trump Administration has proposed terminating funding for the National Endowment for the Arts (NEA) as part of its proposed budget. 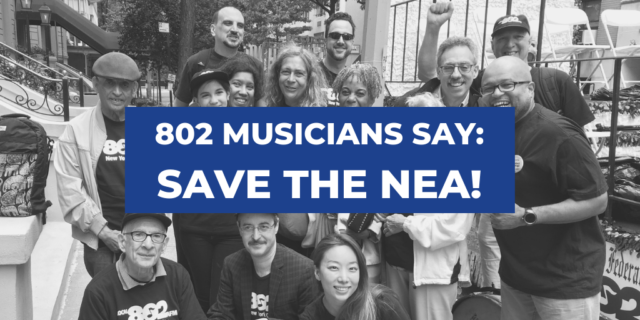 Defunding the NEA would have a strongly negative impact not only on many young and emerging musicians who depend on NEA grants, but also on music education and the underserved communities that benefit from NEA support. That’s why Local 802 strongly opposes any cuts to the NEA’s budget. Write to Congress urging them to preserve funding to the NEA via the AFM petition now. 40% of all NEA-supported activities take place in high poverty neighborhoods. An average of 42 million adults and 8.3 million children annually engage with the arts through live events produced by NEA-funded projects. $1 awarded by the NEA in direct grants to nonprofit organizations will leverage $9 from other non-federal sources. The NEA arts education grant program is focused on pre-K to 12th grade students, producing lower dropout rates and higher grade point averages for students who participate in arts education. In short, defunding the NEA would have a crushing impact on the U.S. arts ecosystem, and the underprivileged communities that depend on the NEA. The defunding of the NEA would have a particularly significant impact on New York, which receives more NEA funding than any other City in the United States. Culture and the arts have always been integral to the health and vibrancy of any society. 802 musicians are committed to improving the lives of all New Yorkers with our art – not only through live performance and recorded music – but also through teaching and community-building. The value and positive impact that the NEA has on the daily lives of New Yorkers cannot be overstated, and it must be preserved. Let’s fight to keep the NEA funded.